Starring: Amitabh Bachchan, Vinod Khanna, Rishi Kapoor, Shabana Azmi, Neetu Singh, Parveen Babi and Nirupa Roy. Singers: Mohammad Rafi, Kishore Kumar, Lata Mangeshkar, Mukesh Chand Mathur, Mahendra Kapoor and Shailendra Singh. Laxmikant-Pyarelal assembled an impressive array of male singers to give voice to the massive star power that was Amitabh Bachchan, Rishi Kapoor and Vinod Khanna. Curiously, L-P did not employ the same tactic regarding the female voices and Lata Mangeshkar provided the voice for Shabana Azmi, Parveen Babi and Neetu Singh. Perhaps, a wise move on their part, seeing as how in those days every actress wanted to feature in a song rendered by Lata. “Amar Akbar Anthony” begins with an ear-pleasing blend of accordion and shakers (now these are instruments that you rarely ever hear in the latest songs). One of Rishi Kapoor’s long-time favourite singers, Shailendra Singh, turns up for the ride with Kishore Kumar and Mahendra Kapoor. It is great to hear the three singing together, the singers add a shade of ardour to the typical but entertaining title tune. qawalli has quite a lengthy introductory piece before the main tune is established. Even Rafi’s entrance is part of the introduction. And what an entrance it is! “Shabab main zara si sharab phekoonga” Anand Bakshi’s lyrics give a nice rhyming twist on the words “shabab” and “sharab”. Mohammad Rafi was born for this song because it plays to his vocal strengths. Boisterous, fervent, and rebellious… Rafi’s voice depicts all these moods with élan. The style of music and singing in each part of “Humko Tumse Hogaya Hai Pyar Kya Karen” changes to suit each character in the film. What is great about it is that it brings three male legends of playback singing together- Mohammad Rafi, Kishore Kumar and Mukesh (with Lata Mangeshkar). Listening to the song, one feels sad that these artists are no more in this world. The song opens with Kishore and Lata taking the reins. Their part is chirpy and vigorous and their declaration of “love you love you” is electric. The banjo interludes dominate the first part but that is abandoned for the next verse (by Mukesh). To portray the quiet romance between the characters played by Vinod and Shabana, the music turns traditional and evocative. The part where Mukesh and Lata sing over each other sends a chill down my spine and, in my opinion, is a piece of musical brilliance. Special mention must go to Lata, whose voice fluctuates to adapt to the different characters she is singing for. Oh my! That is what you will say when you hear the rip-roaring “My Name Is Anthony Gonsalves”. Amitabh Bachchan lends a bit of dialogue support to Kishore Kumar. Amitabh is delightful with his quick-fire nonsensical babble of difficult English words. Using a melee of violins, trumpets and drums, this is a rowdy and light-hearted tune that parodies cabaret songs. Kishore Kumar is in masti mode and the female accompaniment (Parveen Babi?) is cute with her short but sweet exclamations of surprise. In the genre of comic songs, this is definitely one of the best. 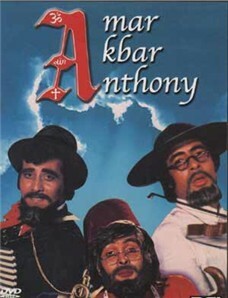 Overall, “Amar Akbar Anthony” is one of the finest examples of an album where the list of playback singers matches the star-power in the film.